Have you ever talked with an inanimate object? Well, today, we’re sharing a recent conversation we had with a name badge! We sat down over the long, holiday weekend with a Name Badge and asked several questions about how a name badge works and why they think their job is so important. Here are the top three questions from that interview. Reporter: I would like to start with a simple question, Name Badge. Please explain your job and what it is that you do on a daily basis. Name Badge: Whoa! Slow down there! That’s a super detailed question, and it will take more than just a few minutes to answer. Are you sure you want to start with that one? Reporter: Yes, I am sure. Name Badge: Alright, glad you’re sitting down. So, here it goes. Although my job isn’t a simple one, it is reasonably easy to do. You see, the basic concept of my job is to let people know my name. But, here’s where it gets complicated. My name changes. My design changes. Sometimes I have color and sometimes I’m plain or even blank. Reporter: That is a lot to take in, Name Badge. But I think you’re deviating from the question. What is your job? Name Badge: First off, call me NB, it’s easier. In a nutshell, my job is to tell others who I am. Reporter: That doesn’t sound too hard, NB. So, why do you think it’s so complicated? NB: My job is complicated because of the many different ways people customize and use me. Question 2: What Customizations Are Available? NB: As I mentioned before, my design changes. Some people use their first name. Others use first and last names, while still others add titles, company names and sometimes even logos. And, I come in many different colors. I’m a chameleon that way. Oh, and sometimes people write on me. Reporter: So, basically what you are telling me is that you have many faces? If that is the case, how do people know how to use you? NB: Yes, I do have many faces. And sometimes that makes it a bit harder to use me. Although, to most people, using me is a natural thing; especially when those people work in stores or offices with tons of employees. Most know that I wear best on the right side of their shirt, but sometimes people put me in their pockets or place me where I’m hard to read. I do my job best when worn correctly. Reporter: So, NB, if you’re appropriately worn and used correctly, what is your best feature? NB: You like asking loaded questions, don’t you? NB: Well, my best feature is the one the consumer likes the most. So, if they worked hard on their company’s branding, the logo would be my best feature. But, if the person wearing me needs others to know that they are a volunteer, then my title would be my best feature. Does that make sense? Reporter: Yes, I suppose it does. So, your best feature is what others need it to be? Reporter: Wow! I’ve learned a lot from you today, NB. Thanks. I should probably be wearing a name badge, too! A company’s brand is what they are, what they want to be, and what they aim to become as a whole. It can be a promise of quality, trust or service. A brand is what makes a company or organization truly unique. Branding should make any business stand out from its competitors. And it lets the consumer know what to expect from that company. Branding is one of the most important parts of any business, whether it be large or small. Building a strong brand helps a company or organization be financially secure. Product marketing is really where this process all begins. To be successful in marketing a company’s brand, one must have a strong branding or marketing strategy. To determine the brand of a business, one must identify a target market and the product or service distribution means. By doing so, the organization can communicate the brand to this target market. And with the use of personalized ribbons, a company’s brand will truly stand out. Personalized ribbons are truly a great tool for company branding. Brand Identity: This is the customer’s knowledge of and ability to recognize the brand. Brand Meaning: This is the character of the brand beyond the image, and includes product or business features, reliability, value and experience. 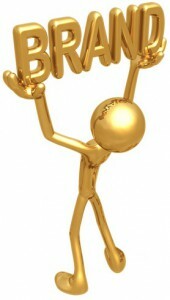 Consumer Relationship: This is the attitude of the customer toward the brand. Remember that a brand is the means to communicate with a chosen market. Each brand needs to be visually stimulating. This encourages product loyalty. Carefully designed branding leads to a secure business or organization. An organization’s brand should possess the above characteristics. 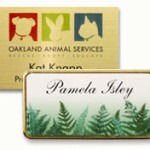 Many of our name tags and other personalized products can have a logo added. 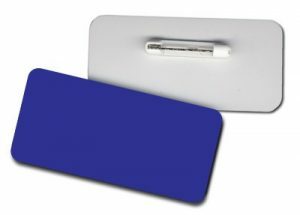 Name Tags can be laser engraved or printed with a logo and company name as well as a person’s name. Name Badges come with printable inserts that can easily have a company logo added. Even order custom lanyards with a company or organization logo to promote branding at a corporate event. A company brand serves as a promise to the customer. Whether this promise is of services or product, remember that the brand will be used in a marketing strategy and requires extensive research. Consumers must understand a brand to increase the effectiveness and value for the company. A company’s brand is what they are, what they want to be, and what they aim to become as a whole. It can be a promise of quality, trust or service. A brand is what makes a company or organization truly unique. Branding should make any company stand out from its competitors and lets the consumer know what to expect from that company. Branding is one of the most important parts of any business, whether it be large or small. Building a strong brand helps a company or organization be financially strong. Product marketing is really where this process all begins. In order to be successful in marketing a company’s brand, one must have a strong branding or marketing strategy. To determine the brand of a business, one must identify a target market and the product or service distribution means. By doing so, the organization can communicate the brand to this target market. And with the use of personalized ribbons, a company’s brand will truly stand out. Personalized ribbons are truly a great tool in company branding. Remember that a brand is the means to communicate with a chosen market. Each brand needs to be visually stimulating, thereby encouraging product loyalty. Carefully designed branding leads to a secure business or organization. An organization’s brand should posses the above characteristics. An organization’s brand serves as a promise to the consumer. Whether this promise is of services or product, remember that the brand will be used in a marketing strategy and requires copious research. Consumers must understand a brand to increase the effectiveness and value for the company.